Since I've known her Kerry-Anne's wanted to go skydiving. We tried going for a jump in Citrusdal about 5 or 6 years ago, but that little trip was called off due to an airplane malfunction before we even climbed on board! After putting off the jump for several years she eventually decided to give it a go and had LessFuss (who are awesome) book the jump with Downhill Adventures. 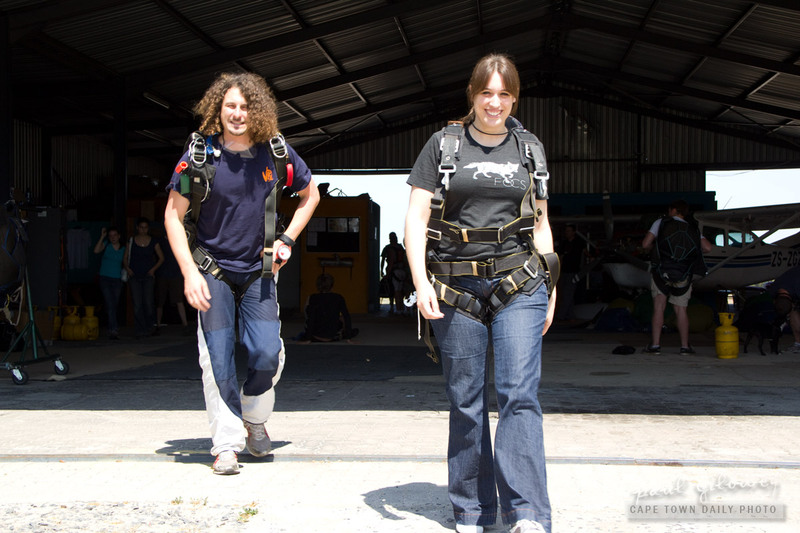 The guy walking up behind Kerry-Anne was the German who she had attached to her back for the tandem jump. For reference, jumpers are attached to each other with four clasps that (luckily) make it fairly impossible for them to get separated. Posted in Activities and tagged extreme, skydiving on Tuesday, 11 October, 2011 by Paul.